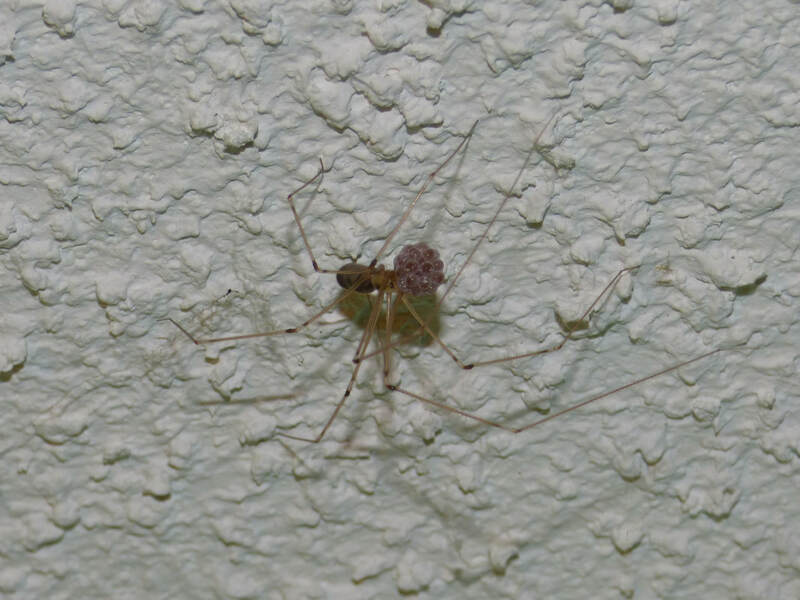 Long-bodied Cellar Spider with prey. Description: Very long legged spider with small narrow body. Somewhat translucent looking, females larger than males and can have distended abdomens from eggs within. 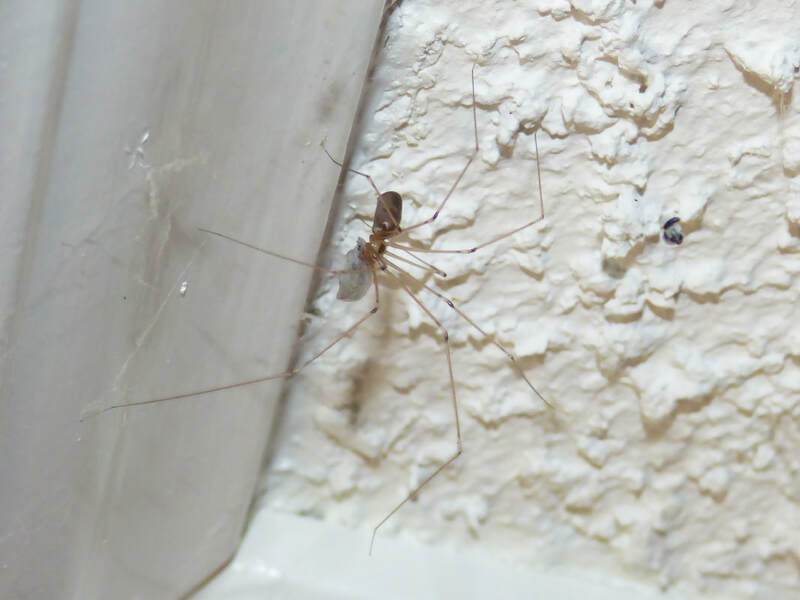 Mistakenly called a daddy-long legs, a distant relative of all spiders. Web: Irregular tangle of web strands, not very strong. It is built in dark corners and crevices. Eggs: 17-42, held in a very fine sac of silk, held by the female in her web. Spiderlings stay in the web with the mother until their first shedding. 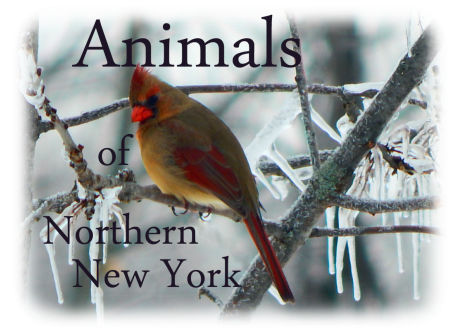 Habitat: Houses, barns, sheds, basements, under porches, outbuildings, under tables, in cabinets and corners, and under furniture. Often builds a web in houseplants. Outdoors around houses and in crevices or caves. Diet: Insects such as flies, beetles, moths, centipedes, ants, mosquitoes and other spiders. They are extremely beneficial to have in your home. These spiders capture large amounts of household pests such as mosquitoes, flies, larder chafers, drugstore beetles, meal moths, ants, Asian ladybugs and other spiders (ones that wander on the floors). I have even seen a deer tick captured by one of these spiders. Prey is heavily wrapped in a veil of very fine silk, turning it whitish in color (see inset picture). One myth that surrounds these spiders is the fact that they have the most toxic venom of any spider but cannot bite because they are too small. This is ridiculous and completely false, they have mild venom that takes quite a bit to even immobilize their small insect prey. 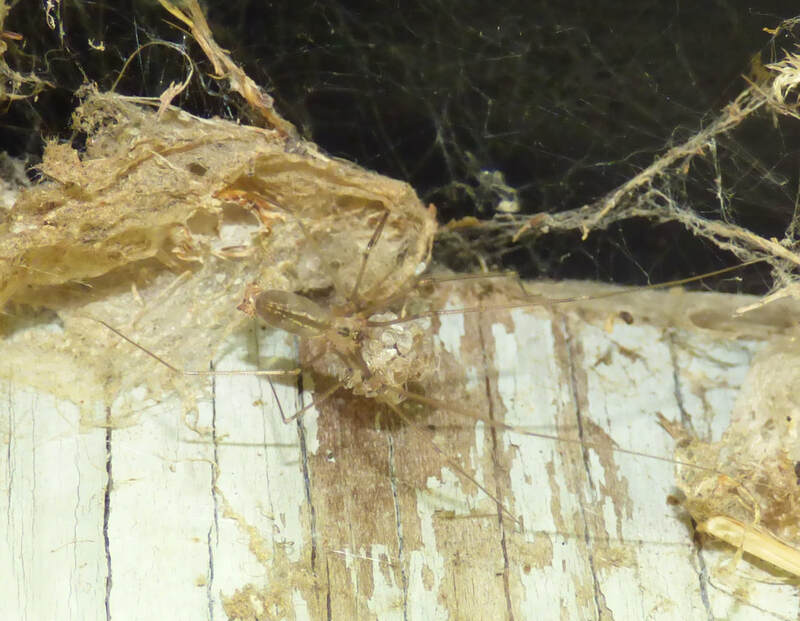 They regularly cannibalize each other, not to be confused with the shed exoskeletons left as the spiders grow. Eggs held in the female's mouthparts.